Heat oven to 350° F. Grease bottom and sides of 9-inch or 8-inch square pan with shortening. In large bowl, beat all ingredients except toffee bits, coconut and nuts with electric mixer on low speed 30 seconds. Beat on medium speed 2 minutes, scraping bowl occasionally. Stir in 2 tablespoons of the toffee bits. Pour into pan. 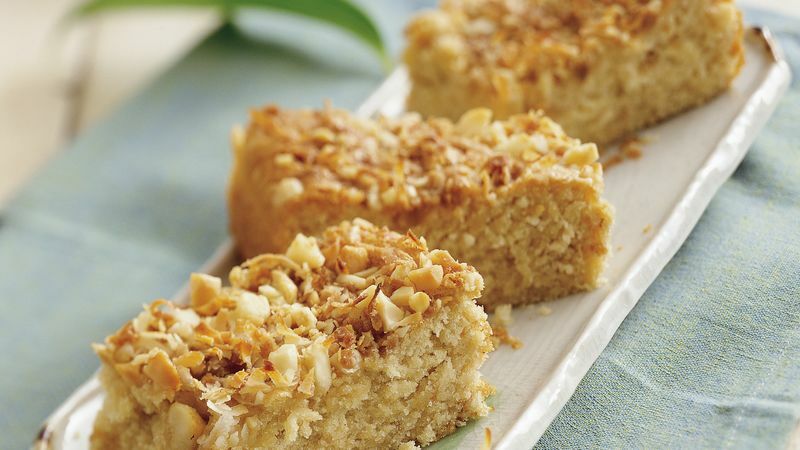 Sprinkle remaining 2 tablespoons toffee bits, the coconut and nuts over batter. Bake 32 to 35 minutes or until toothpick inserted in center comes out clean. Cool completely, about 1 hour.